Download this research paper and learn how to align your organization’s analytics capabilities with its business needs and intended use. Organizations are turning to analytics to help drive decision-making, but analytic capabilities are not a one-size fits all. With the multitude of different types of decisions to be made and analytic capabilities available it can be difficult for organizations to choose the right capabilities. 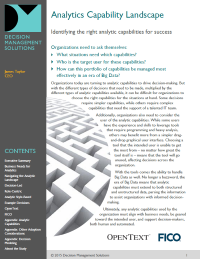 This research by Decision Management Solutions compiles an analysis of the different types of analytic capabilities available today — from reporting and data discovery to advanced analytics — to help organizations choose the right solution depending on the kind of decisions, the business situation and the target user.